Did you hear the one about the archivist mohel? He saved all his clippings…in acid-free boxes. Finally, another entry for the Deranged Dictionary! 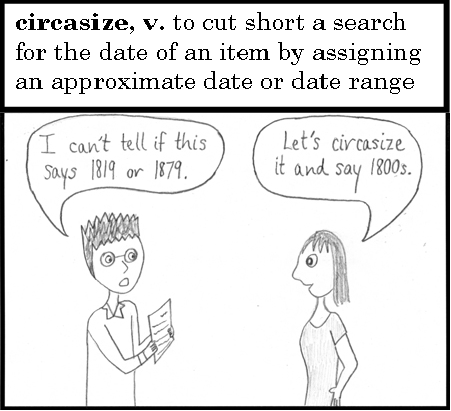 I’m a fan of the Glossary of Archival and Records Terminology–I often refer to it when I draw my comics–but it just isn’t very funny. Today I present the first installment of what I hope will be an ongoing series: The Deranged Dictionary. These are words that I think would be fun to have in our collective vocabulary, with helpful illustrations of their (intended) usage. If you use a Deranged Dictionary word in conversation, please let me know! When I get enough submissions, I’ll make a page for them on the site. Now, on to this week’s comic!